Annie Arniel was among the first suffragists jailed for three days on June 27th, 1917, for picketing the White House – choosing prison rather than pay a fine of $25. A factory worker living in downtown Wilmington, Delaware, she was recruited by Mabel Vernon and Alice Paul for membership in the National Woman’s Party. 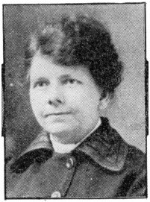 She served a total of eight jail terms for suffrage protesting and served a total of 103 days, including: 3 days June, 1917; 60 days in the Occoquan prison in Virginia, August-September, 1917 for picketing; 15 days for Lafayette Square meeting, and five sentences of 5 days each in January and February, 1919 for the watchfire demonstrations. During one of her arrests when she was picketing Congress, she was knocked senseless by the police. While picketing she held one of the more notable banners that read: “As our boys are fighting for democracy abroad, is it a crime to ask for democracy in our own country?” She also argued after one of her arrests that “We were good enough to work in the steel plant and help load shells for the battlefields of France, but we are still not good enough to vote it seems. Can anyone see justice in this? We are protesting against the unjust delay of the Senate in passing the Susan B. Anthony suffrage amendment and why shouldn’t we? She said the rations served in prison made her so weak, she fainted for the first time in her life. Source: Portions taken from: Doris Stevens, Jailed for Freedom (New York: Boni and Liveright, 1920), 355.